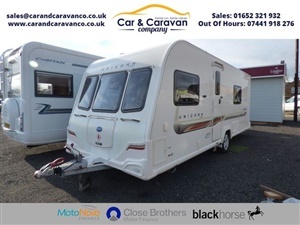 For sale we have a stunning Bailey Unicorn Valencia. With A full end washroom Fixed bed U shape lounge Thetford Oven/Grill With 4 Hobs Kempa Rally 390 Awning Included Used External Gas bottle included Jvc radio/ Cd Player Daewoo Microwave ALU-TECH BODYSHELL Alde Water heating system this is a stunning 4 Berth Family Caravan We have many caravans in stock so if you cant find the Caravan layout you are looking for please ask With over 250 cars, we are certain to have your new vehicle ready and waiting. Our huge variety of finance providers, combined with our experienced sales team, means we offer incredible finance packages for every customer. As a CarGuru?s Top Rated Dealer of 2018, and 5 Star Trusted AutoTrader Reviews, our service is equally as impressive as our range of vehicles and finance packages. All vehicles are fully prepped and ready to drive away on the day. Please call before coming to view.